Young Alice Sinclair was among the first piano players in Calais to provide a musical accompaniment to the silent films of the early 20th century. 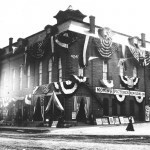 She began her work just after the first World War. Sinclair eventually moved to Meddybemps and lived the last years of her life in Calais at the Holmestead when it was a senior citizen home. During the silent movie era the piano player was often as big a draw as the film itself. Many films came with suggested songs to be played during particular scenes but others piano players like Alice relied on inspiration rather than instruction. turned to romance, she would play a love song. would play along with the action,” she said. and he would let it out on purpose to irritate her,” he said. a change from playing for movies,” she said with a laugh. House on Main Street in Calais, a retirement home for senior citizens. use in perpetuity as a home for senior citizens. 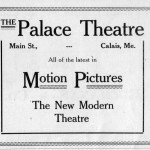 An ad from the Palace Theater, Calais, Maine, dating to 1914. 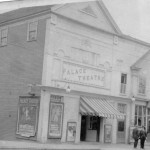 The Palace Theater on Main Street in Calais. 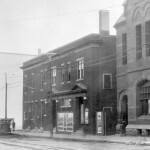 The Opera House, Calais, Maine, in 1910. 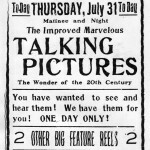 This flyer from 1913 advertised the improved talking movies featured at the Opera House in Calais. 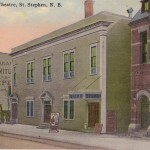 The Bijou theater in St. Stephen, with the Queen Hotel directly across. 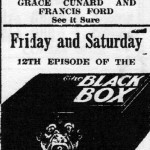 A flyer from the Bijou Theater dating to 1915.